Mainstream descriptions of the Earth’s atmosphere tend to focus upon five nebulous atmospheric layers and a table of atmospheric gases which suggests Nitrogen [at 78.084%] is the dominant gas. These mainstream overviews conveniently omit details Settled Science wants to ignore. Therefore, the objective of this post is to provide some balance by documenting some of the hidden gems I have stumbled across in the last few years. 1) Molecular Nitrogen [N2] at sea-level. 2) Atomic Oxygen [O1] at an altitude of about 200 kilometres. 3) Helium [He] at an altitude of about 650 kilometres. 4) Atomic Hydrogen [H1] at an altitude well above 1,000 kilometres. International quiet solar year daytime ionospheric and atmospheric composition based on mass spectrometer measurements [Johnson, 1969; Luhmann, 1995]. The Extreme Ultraviolet Imager (EUV) images the distribution of He+ in Earth’s plasmasphere by detecting its resonantly-scattered emission at 304 Å [30.4 nm]. A peculiarity of many mainstream atmospheric descriptions is their preference for reporting atmospheric density in kilograms per cubic metre [see example below] rather than the more usual particle count per cubic centimeter [see example above]. This perverse perspective attempts to imply the atmosphere above 35 kilometres is virtually devoid of particles and importance. This is very misleading because even at an altitude of 1,000 kilometres the atmospheric particle count is above 1011 per cubic metre with Helium and atomic Hydrogen being the dominant species [see above]. The mainstream tendency to overlook the middle atmosphere is probably because it is “the least understood region of the earth’s atmosphere” which supports complex photochemical and dynamic interactions. The middle atmosphere is a region of complex photochemical and dynamic interaction. Stretching from roughly 30 to 100 km altitude, it is the transition region between the stratosphere and the thermosphere and is perhaps the least understood region of the earth’s atmosphere. Inaccessible to balloons and satellites, observations of this region must be made by direct in situ rocket measurements or by satellite borne or ground based remote sensing techniques. The middle atmosphere is characterized by a variety of interesting and important features. For example, the temperature minimum at the mesopause near 90 km is the coldest part of the atmosphere. The ionosphere D-region is part of the mesosphere and near 100 km is the turbopause, above which eddy mixing is absent. A variety of structures and found in the mesosphere including noctilucent clouds, the polar mesospheric dust layer, the airglow layers and the alkali metal layers of sodium, lithium and potassium. The primary energy source driving these complex photochemical interactions in the middle atmosphere is the absorption of inbound gamma rays [aka cosmic rays], x-rays and ultraviolet light. Cosmic rays are immensely high-energy radiation, mainly originating outside the Solar System. They may produce showers of secondary particles that penetrate and impact the Earth’s atmosphere and sometimes even reach the surface. Gamma radiation, also known as gamma rays, and denoted by the Greek letter γ, refers to electromagnetic radiation of an extremely high frequency and therefore consists of high-energy photons. Gamma rays are ionizing radiation, and are thus biologically hazardous. Natural sources of gamma rays on Earth include gamma decay from naturally occurring radioisotopes such as potassium-40, and also as a secondary radiation from various atmospheric interactions with cosmic ray particles. Ultraviolet (UV) light is an electromagnetic radiation with a wavelength from 400 nm to 100 nm, shorter than that of visible light but longer than X-rays. Though usually invisible, under some conditions children and young adults can see ultraviolet down to wavelengths of about 310 nm, and people with aphakia (missing lens) can also see some UV wavelengths. Inbound, high energy gamma rays [aka cosmic rays] drive Nuclear Spallation which generates Cosmogenic Nuclides [such as Carbon-14] and drive Hadronic Showers and Electromagnetic Showers which cascade down into the atmosphere. Nuclear spallation occurs naturally in Earth’s atmosphere owing to the impacts of cosmic rays, and also on the surfaces of bodies in space such as meteorites and the Moon. Evidence of cosmic ray spallation (also known as “spoliation”) is evidence that the material in question has been exposed on the surface of the body of which it is part, and gives a means of measuring the length of time of exposure. The composition of the cosmic rays themselves also indicates that they have suffered spallation before reaching Earth, because the proportion of light elements such as Li, B, and Be in them exceeds average cosmic abundances; these elements in the cosmic rays were evidently formed from spallation of oxygen, nitrogen, carbon and perhaps silicon in the cosmic ray sources or during their lengthy travel here. Cosmogenic isotopes of aluminium, beryllium, chlorine, iodine and neon, formed by spallation of terrestrial elements under cosmic ray bombardment, have been detected on Earth. Cosmogenic nuclides (or cosmogenic isotopes) are rare isotopes created when a high-energy cosmic ray interacts with the nucleus of an in situ Solar System atom, causing cosmic ray spallation. These isotopes are produced within Earth materials such as rocks or soil, in Earth’s atmosphere, and in extraterrestrial items such as meteorites. Cosmic rays hit earth’s atmosphere on a regular basis, and they produce showers as they proceed through the atmosphere. It was from these air showers that the first muons and pions were detected experimentally, and they are used today by a number of experiments as a means of observing ultra-high-energy cosmic rays. Some experiments, like Fly’s Eye, have observed the visible atmospheric fluorescence produced at the peak intensity of the shower; others, like Haverah Park experiment, have detected the remains of a shower by sampling the energy deposited over a large area on the ground. The inbound high energy rays [plus the resulting particle cascades] and ultraviolet light also drives the Ionisation of atmospheric gases which [in their turn] drive Recombination. Ionization is the process by which an atom or a molecule acquires a negative or positive charge by gaining or losing electrons to form ions, often in conjunction with other chemical changes. Ionization can result from the loss of an electron after collisions with sub atomic particles, collisions with other atoms, molecules and ions, or through the interaction with light. The ionosphere is a region of Earth’s upper atmosphere, from about 60 km (37 mi) to 600 km (370 mi) altitude, and includes the thermosphere and parts of the mesosphere and exosphere. It is distinguished because it is ionized by solar radiation. It plays an important part in atmospheric electricity and forms the inner edge of the magnetosphere. It has practical importance because, among other functions, it influences radio propagation to distant places on the Earth. At night the F layer is the only layer of significant ionization present, while the ionization in the E and D layers is extremely low. During the day, the D and E layers become much more heavily ionized, as does the F layer, which develops an additional, weaker region of ionisation known as the F1 layer. The F2 layer persists by day and night and is the region mainly responsible for the refraction of radio waves. Plasma recombination is a process by which positive ions of a plasma capture a free (energetic) electron and combine with electrons or negative ions to form new neutral atoms (gas). The inbound high energy rays [plus the resulting particle cascades] also drives the Photodissociation of atmospheric gases which [in their turn] drive Recombination. It is defined as the interaction of one or more photons with one target molecule. Photodissociation is not limited to visible light. Any photon with sufficient energy can affect the chemical bonds of a chemical compound. Since a photon’s energy is inversely proportional to its wavelength, electromagnetic waves with the energy of visible light or higher, such as ultraviolet light, x-rays and gamma rays are usually involved in such reactions. Dissociation in chemistry and biochemistry is a general process in which molecules (or ionic compounds such as salts, or complexes) separate or split into smaller particles such as atoms, ions or radicals, usually in a reversible manner. For instance, when an acid dissolves in water, a covalent bond between an electronegative atom and a hydrogen atom is broken by heterolytic fission, which gives a proton (H+) and a negative ion. Dissociation is the opposite of recombination. Perhaps the most well known atmospheric layer is the Ozone Layer [at an altitude of between 20 and 30 kilometres] where the Photodissociation of atmospheric gases containing Oxygen enables Ozone [O3] to form via Recombination. The ozone layer or ozone shield refers to a region of Earth’s stratosphere that absorbs most of the Sun’s ultraviolet (UV) radiation. It contains high concentrations of ozone (O3) relative to other parts of the atmosphere, although still very small relative to other gases in the stratosphere. The ozone layer contains less than 10 parts per million of ozone, while the average ozone concentration in Earth’s atmosphere as a whole is only about 0.3 parts per million. The ozone layer is mainly found in the lower portion of the stratosphere, from approximately 20 to 30 kilometres (12 to 19 mi) above Earth, though the thickness varies seasonally and geographically. In the middle atmosphere [above the Ozone Layer] there are a number of chemical layers which are not so well publicised. Mid-August observations in 2012 and 2013 show the decrease of single scattering polarization value that can be related with Perseids meteor dust moderation in the upper mesosphere. 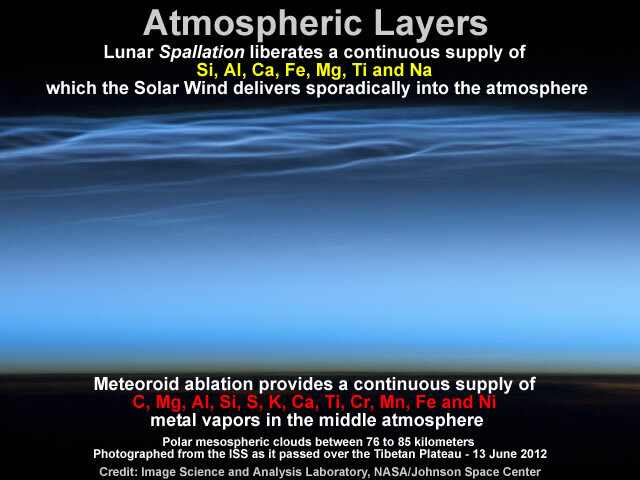 Vapors and plasmas generated by meteoroid ablation in the middle atmosphere cause steady-state metal abundances with short-lived enhancements possible during exceptionally strong meteor showers. The surviving, collected, meteoroids include stratospheric interplanetary dust particles (IDPs) (2-100 microns), mostly spherical micrometeorites (MMs) (up to ~500 microns) and meteorites (cm-sized and up). Chondritic IDPs from icy protoplanets, mostly active comets, have >CI volatile element abundances. MMs are mostly type-CM debris from progenitors ~30 to ~1,000 microns prior to ablation that represent the peak in the annual terrestrial mass accretion rate. The ordinary chondrites (OC) meteorites represent ~85% of meteorite `falls’ and `finds’ but only ~40% of the total meteorite mass. Iron meteorites account for 50% of the mass but only ~4% of meteorites. Carbonaceous chondrite meteorites (~9% of the mass) are under-represented due to their friable nature resembling Group II fireballs. These proto-CI meteorites might have a cometary provenance. The annual amount of MM ablation vapor is 2 × 106 kg, meteorite-producing meteoroids deposit an estimated 3.7 × 106 kg vapor and IDP-like meteoroids ~0.4 × 106 kg in the middle atmosphere. This estimated amount of meteoric vapor is mostly due to OC and CM meteoroid ablation which provides a continuous supply of C, Mg, Al, Si, S, K, Ca, Ti, Cr, Mn, Fe and Ni metal vapors. The most visible layer in the middle atmosphere is the Noctilucent Cloud layer at an altitude of [roughly] 76 to 85 kilometres. Night clouds or noctilucent clouds are tenuous cloud-like phenomena that are the “ragged edge” of a much brighter and pervasive polar cloud layer called polar mesospheric clouds in the upper atmosphere, visible in a deep twilight. They are made of crystals of water ice. They can be observed only when the Sun is below the horizon. They are the highest clouds in Earth’s atmosphere, located in the mesosphere at altitudes of around 76 to 85 kilometres (47 to 53 mi). They are normally too faint to be seen, and are visible only when illuminated by sunlight from below the horizon while the lower layers of the atmosphere are in the Earth’s shadow. The Sodium Layer [at an altitude between 80 and 105 kilometres] is not usually visible during daylight hours. Refers to a layer within the Earth’s mesosphere of unbound, non-ionized atoms of sodium. The altitude of this layer is usually located between 80–105 km (50–65 miles) and has a depth of about 5 km (3.1 mi). The sodium comes from the ablation of meteors. Atmospheric sodium below this layer is normally chemically bound in compounds such as sodium oxide, while above the layer the atoms tend to be ionized. The density varies with season; the average column density is roughly 4 billion sodium atoms/cm2. But the Sodium Layer is known to fluoresce [aka Resonant Scattering] at 589 nm and contributes to the Airglow that can be observed at night. Atoms of sodium in this layer are typically in an excited state, and radiate weakly at a wavelengths around 589 nm, which is in the yellow portion of the spectrum. These radiation bands are known as the sodium D lines. The resulting radiation has been termed night glow. Airglow is caused by various processes in the upper atmosphere, such as the recombination of atoms, which were photoionized by the sun during the day, luminescence caused by cosmic rays striking the upper atmosphere and chemiluminescence caused mainly by oxygen and nitrogen reacting with hydroxyl ions at heights of a few hundred kilometres. Scattering of a photon by a quantum-mechanical system (usually an atom or nucleus) in which the system first absorbs the photon by undergoing a transition from one of its energy states to one of higher energy, and subsequently reemits the photon by the exact inverse transition. The middle atmosphere between 100 and 250 kilometres is also associated with the nocturnal fluorescing of atmospheric gases know as Auroras. Aurorae are caused by cosmic rays, solar wind and magnetospheric plasma interacting with the upper atmosphere (thermosphere/exosphere). Their charged particles, mainly electrons and protons, enter the atmosphere from above causing ionization and excitation of atmospheric constituents, and consequent light emissions. Incident protons can also produce emissions as hydrogen atoms after gaining an electron from the atmosphere. Fluorescing Nitrogen in D Layer of the Ionospheres in all likelihood causes a daytime Blue Sky Aurora although the mainstream prefers to attribute the blue sky to the preferential Rayleigh Scattering of blue light. The Lithium Layer is less well documented but is [also] known to fluoresce. Lithium resonance radiation in the twilight air-glow of the southern hemisphere has recently been observed in several places. Over Adelie Land in the Antarctic this radiation is reported to have been present both in 1957 and 1958. In October 1957 its intensity was estimated visually to be of the order of a tenth that of the sodium D lines in the twilight. After the high-altitude nuclear bomb explosion in the Pacific in August 1958 this radiation was also observed at Hallett Station in the Antarctic and afterwards in September at Invercargill in New Zealand. Its intensity is roughly estimated as equal to the total sodium D line intensity at Hallett in August and a tenth of this in New Zealand in September. The Potassium Layer between 80 and 105 kilometres is probably associated with meteoroids. 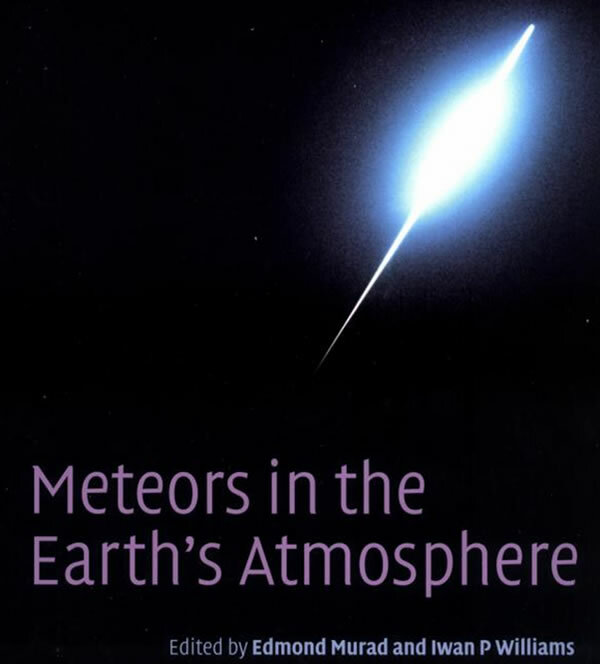 In the past, many studies have been carried out to demonstrate the influence of meteoroids on the atmospheric metal layer, observed roughly in the altitude range 80–105 km. A comparison of metal densities at 113 km altitude with known meteor showers indicates a strong influence of shower meteoroids on the topside of the metal layers. The Potassium Layer and Calcium Layer are also associated with Sporadic E radio propagation which bounces signals off smaller “clouds” of unusually ionized atmospheric gas. Sporadic E or Es is an unusual form of radio propagation using characteristics of the Earth’s ionosphere. Whereas most forms of skywave propagation use the normal and cyclic ionization properties of the ionosphere’s F region to refract (or “bend”) radio signals back toward the Earth’s surface, sporadic E propagation bounces signals off smaller “clouds” of unusually ionized atmospheric gas in the lower E region (located at altitudes of approx. 90 to 160 km). As its name suggests, sporadic E is an abnormal event, not the usual condition, but can happen at almost any time; it does, however, display seasonal patterns. Sporadic E activity peaks predictably in the summertime in both hemispheres. In North America, the peak is most noticeable in mid-to-late June, trailing off through July and into August. A much smaller peak is seen around the winter solstice. No conclusive theory has yet been formulated as to the origin of Sporadic E.
Attempts to connect the incidence of Sporadic E with the eleven-year Sunspot cycle have provided tentative correlations. There seems to be a positive correlation between sunspot maximum and Es activity in Europe. Conversely, there seems to be a negative correlation between maximum sunspot activity and Es activity in Australasia. 75.48 W), on 29–30 June 2003 between the hours of 23:19 and 3:07 EST observed an intermediate layer and a plasma density enhancement possibly associated with an internal gravity wave. Ion composition measurements were made by the third payload at 2:50 EST from 80- to 220-km altitude and included observations of three separate regions having high concentrations of metallic ions: a sporadic E layer at 105 km, an intermediate layer at 118 km, and the region above 160 km. This sequence of measurements shows that intermediate layers cannot be treated as flat layers over a scale of hundreds of kilometers and that internal gravity waves may lead to the formation of plasma layers in the nighttime lower F and upper E region ionosphere. The composition observations demonstrate that metallic ions may be a significant source of ionization in the nighttime E and F region ionosphere at midlatitudes, and that the relative ion composition within intermediate layers may fluctuate significantly over horizontal scales of hundreds of kilometers. The upper Fe and Mg bands [from 160 kilometres and counting] are well above the usual altitude range of 76 to 100 kilometres associated with the vaporisation of meteorites and the mainstream appear to be baffled regarding the origins of the Sporadic E layers. However, given that these Fe and Mg measurements were taken at New Moon it’s very likely these upper bands of Fe and Mg [plus the Sporadic E layers] are initially liberated from the Lunar surface [on the far side of the Moon] by Spallation and Sputtering before being delivered by the Solar Wind into the Earth’s atmosphere as a sporadic supply of Si, Al, Ca, Fe, Mg, Ti and Na. Sputtering is a process whereby atoms are ejected from a solid target material due to bombardment of the target by energetic particles. It only happens when the kinetic energy of the incoming particles is much higher than conventional thermal energies (≫ 1 eV). This process can lead, during prolonged ion or plasma bombardment of a material, to significant erosion of materials, and can thus be harmful. Sputtering is one of the forms of space weathering, a process that changes the physical and chemical properties of airless bodies, such as asteroids and the Moon. Finally, to round off this alternate overview of the Earth’s fluorescing atmosphere, it’s worth remembering the observational evidence indicates that atmospheric pressure between the First Isopycnic Level [at 8 km] and the Second Isopycnic Level [at 80-90 km] is determined by spallation, photodissociation, ionization, electron capture and recombination. 1) The Isopycnic Level is where the Density of Air has been observed to vary by less than two percent [relative to the 1976 standard]. 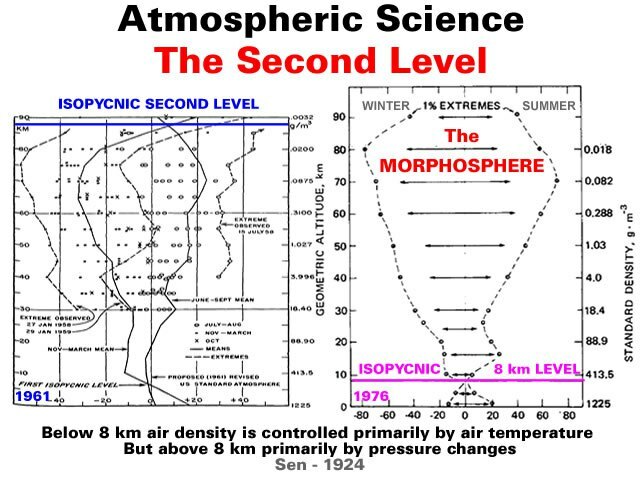 2) The Isopycnic Level is at an altitude of about 8 kilometres in the Earth’s Atmosphere. Evidently, the mainstream powers that be didn’t appreciate the evidence that atmospheric pressure between the First Isopycnic Level and the Second Isopycnic Level was determined by spallation, photodissociation, ionization, electron capture and recombination. Evidently, the mainstream wasn’t ready for the concept of a Morphophere where atmospheric particles morph into [potentially] many new chemical substances and sub-atomic particles whilst simultaneously transforming energy. Gallery | This entry was posted in Atmospheric Science, Cosmic Rays, Earth, Moon, Solar System. Bookmark the permalink. Many years ago, when I first realized the Sun selectively moves light-weight elements and light-weight isotopes of each element to the visible top of the photosphere, I also found that mass-fractionation occurs in air. Those references were difficult to find. I.e., the US NAS betrayed the trust of the American public after 1945 but controls mainstream science by still reviewing annual research budgets of various research agencies – NASA, DOE, EPA, NSF, etc. – for Congress.